Friday July 1st: 2:00 - 3:00 p.m.
“Self-state” is the latest and perhaps most useful iteration of a long line of references to compartmentalized and otherwise isolated aspects of the human mind that are implicated when people think, speak, or act in ways that are at odds with how they usually are. “I don’t know what got into me to say (do) that! I’m so sorry. I couldn’t help it. I’m so ashamed.” This is the kind of sequence of exclamations we hear coming from our own mouths and those of our patients when self-states are activated. This is especially so in eating disorders, sexual acting-out, all manner of addictive behaviors, post-traumatic disorders, complex PTSD, and the dissociative disorders. Borrowing from Self Psychology, Object Relations, Relational Psychoanalysis, Attachment Theory, Affect Theory, and Traumatology Dr. Chefetz will present an integrated model for understanding self-state organization and activity on a subjective level that has immediate applicability to everyday clinical work. 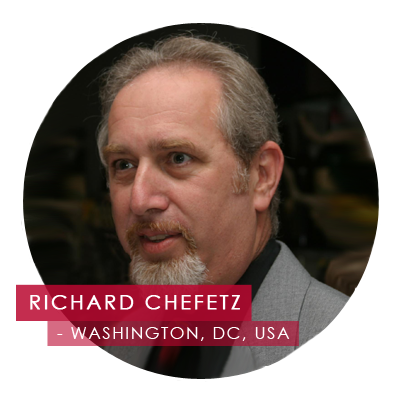 Richard A. Chefetz, M.D. is a psychiatrist in private practice in Washington, D.C. He was President of the International Society for the Study of Trauma and Dissociation (2002-3), Co-Founder and Chair of their Dissociative Disorders Psychotherapy Training Program (2000-2008, and is a Distinguished Visiting Lecturer at the William Alanson White Institute of Psychiatry, Psychoanalysis, and Psychology. He is also a faculty member at the Washington School of Psychiatry, the Institute of Contemporary Psychotherapy & Psychoanalysis, and the Washington Center for Psychoanalysis. He is a Certified Consultant at the American Society of Clinical Hypnosis, and is trained in Level I and II EMDR. Dr. Chefetz was editor of “Dissociative Disorders: An Expanding Window into the Psychobiology of Mind” for the Psychiatric Clinics of North America, March 2006, “Neuroscientific and Therapeutic Advances in Dissociative Disorders,” Psychiatric Annals, August 2005, and “Multimodal Treatment of Complex Dissociative Disorders,” Psychoanalytic Inquiry, 20:2, 2000, as well as numerous journal articles on psychodynamic perspectives on trauma, dissociation, and clinical process. He recently published a book with Norton (2015), in their Interpersonal Neurobiology series, Intensive Psychotherapy for Persistent Dissociative Processes: The Fear of Feeling Real.